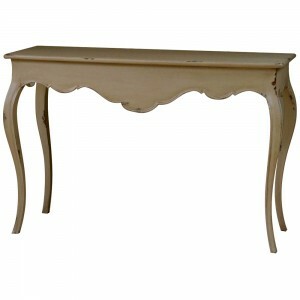 The Provencale 2 drawer French console table looks truly sumptuous. Carved from mahogany this piece is ideal for adding a classical ambience to any space with influences from traditional French style rococo furniture. Painted in a crisp off-white paint, this piece is gently aged with a light patina, giving it that vintage appeal. At Crown French Furniture we strive to offer our customers first class service and products at competitive prices. If you find a cheaper price in a UK high street retailer for the same identical product we'll match it, and if you find it within 7 days after you've purchased from us we'll refund the difference. Simply take a print out of the competitor's price, ensuring, date and price including delivery are shown and send it to us by email (email to: info@crownfrenchfurniture.co.uk). We will match the competitor price if within policy. Intricate carved details highlighted with a light patina for an aged appeal, the Provencale collection is a stunning collection of French influenced furniture.